The second part of the Fantastic Four franchise, Fantastic 4: Rise of the Silver Surfer, is a slight improvement over the first film, Fantastic Four (REVIEW), though not by much. It trades the cartoony aspects for a slightly darker tone, but still doesn’t manage to become a good film along the way. There are some redeeming qualities, mainly to do with the titular character, the Silver Surfer himself. Reed Richards (Ioan Gruffudd) and Sue Storm (Jessica Alba) are dealing with less than dramatic dilemmas as their wedding slowly approaches. Johnny Storm (Chris Evans) is loving his team’s new fame after the events of the last film and The Thing (MichaelChiklis) tags along for comedic quips at Johnny’s expense. Everything is going pretty well until mysterious energy events begin to happen worldwide. The military is at a loss and calls upon Mr. Fantastic and his team for help. The acting is, again, nothing to write home about. Gruffudd gives another wooden performance and Alba looks just as out of place as before. The blonde wig seems to stand out more this time around, drawing more attention to an already lackluster performance. Unfortunately Chiklis is given a lot less to do in terms of characterization. With potential to be the most interesting member of the team, the writers, Don Payne and Mark Frost, instead decide to make the ever loving Thing into a comic relief buffoon. The saving grace of it all is Chris Evans. He returns to the role of the Human Torch in tremendous fashion. Carrying the film on his solid performance, he is able to be just as charismatic and genuinely funny as before. The action is clearly stepped up from the first outing. An increased budget allows for larger set pieces and grander scale for action sequences as the Silver Surfer continually wreaks havoc across the globe. The special effects are lacking in some areas and seem rushed all around. Despite the sub-par CGI, the Surfer still looks spectacular, even with some slight mishaps regarding lip-synching Laurence Fishburne’s voice with the animated Surfer’s movements. 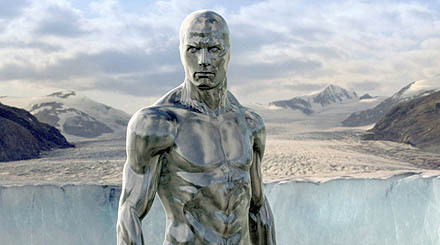 The Silver Surfer remains the best part of the film. His powers are enough to provide a large enough threat without being too powerful. His backstory is explored slightly, just enough to leave you wanting more in a possible stand-alone film (that never happened). The Herald of Galactus remains one of the best page to screen adaptations in the history of comic book movies. Speaking of Galactus, the devourer of worlds himself makes an appearance as the film’s big bad guy, only not in the way many would’ve hoped. Galactus is, in this universe, a cloud. That’s right, a cloud. For many comic fans this is an atrocity, to make such a menacing villain into something as un-terrifying as a cloud is preposterous. And yet it happened, with less than stellar results I might add. Even from a non-fanboy perspective, is a large cloud, albeit a scary, dark cloud, enough to be a formidable opponent? The answer is no. Instead it comes off as rather dull in a rather dull finale to begin with.